The widest range of locally made products is found in Addis Ababa but the main tourist destinations (Lalibela, Bahir Dar, Gonder, Aksum, and Harar) all have plentiful souvenir stalls and shops. In marketplaces, bargaining is expected, but prices at shops in towns are fixed. Special purchases include traditional clothing, hand-woven scarves and shamma (the long cotton robe worn by men and women), crosses made from wood, silver or other metals, leather goods, drums and religious paintings. Addis Ababa's main market (known as the merkado) is thought to be the largest in Africa and is more an experience than a shopping destination. A pleasant alternative is Shiromeda Market, which is often considered as a good place to purchase traditional clothing. For other souvenirs, you are likely to find a bargain in the myriad of stalls and shops that line Churchill Avenue and around the Piazza district. For high-quality goods, Gallery 21 (Churchill Avenue) and Alert Handicraft Shop (off the Addis Ababa Ring Road) are your top choices, while SoleRebels Footwear (several stores including one at the Hilton hotel) is the world's only Fair Trade certified shoe company that makes super-funky footwear using organic cotton and traditional eucalyptus looms. 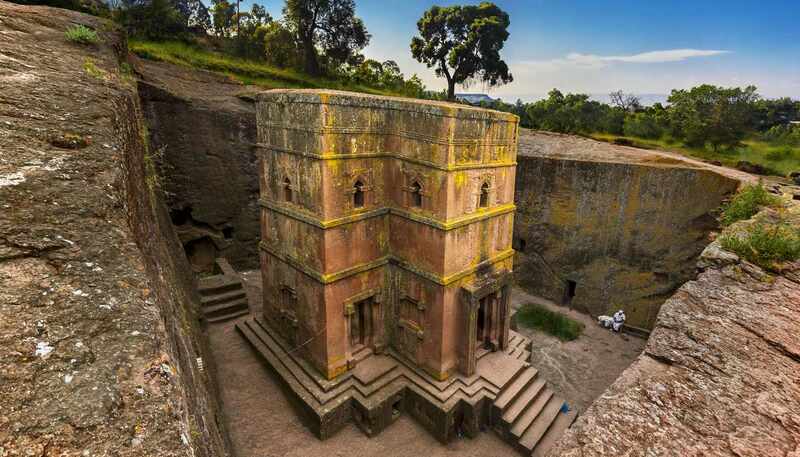 Outside of the capital, Aksum is known for its basketry work, Bahir Dar is famed for its leather 'picnic basket' known as agelgil, and Harar is the place to head for quality coffee beans. Mon-Sat 0800-1300 and 1400-1730 (with local variations). Azmari is hugely popular throughout Ethiopia. The term refers to a wandering minstrel (the azmari) who plays a masinko (a type of musical instrument), sings and interacts with the audience. The songs are about life in general, with impromptu poems and witty wordplay which often has double meanings. There are fantastic azmari bets (bars where azmari regularly performs) in Addis Ababa, Bahir Dar, Gonder and Lalibela. Yebahil Misuit, meaning cultural night, is a vibrant mixture of singing and dancing performed by men and women who often dressed in traditional costumes to a roaring crowd. The other form of traditional nightlife revolves around tej (Ethiopia's fermented honey wine). Tej bets, meaning the house that serves tej, are found throughout the country, even in the smallest towns. Tej bets generally close by midnight so don't expect a late night. In Addis Ababa, there is a growing number of Western-style bars, pubs and nightclubs. Jazz is enjoying a revival in the capital city while the Beer Garden Inn (Bole Road) houses Garden Bräu, the first microbrewery in East Africa, producing beers using German barley and adhering to the Reinheitsgebot (German beer purity law) which permits only water, barley and hops to be used in the brewing process. Going to the cinema is a popular evening activity among Ethiopians. Local productions and foreign films are screened in their original language, while foreign films may have Amharic subtitles.